The DNA in saliva originates from cells that are shed from the inner linings of the mouth and from white blood cells. These DNA-containing cells are collected, and the DNA is then extracted by various methods. Easy and accurate salivary DNA analysis enables the genotyping of well-characterized single nucleotide polymorphisms (SNPs) that can profoundly impact your research. Research has revealed that salivary DNA is equivalent in quantity and purity to DNA obtained from blood(1-3), and that the stability of salivary DNA is good when proper methods of handling are employed (2,4). With Salimetrics’ DNA extraction protocol and greater than 99% call rate or genotype assignment, you can expand your data set to draw better conclusions by simply adding DNA analysis to your study design. 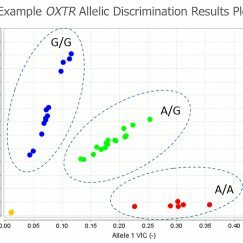 Salimetrics DNA Analysis Service can test for over 160,000 polymorphisms. Feel free to Contact Us to discuss your project and set-up a custom panel to fit your research focus and budget. High quality salivary DNA is easily available without the need for expensive, specialized collection devices. In order to insure that adequate amounts of DNA can be extracted, we request that 1.5-2.0 mL of saliva be collected from each participant. This amount will also allow the sample to be tested for hormones or other biomarkers, if requested. If you have frozen samples that were already collected for a project and you wish to submit them to our genotyping service, please contact us for handling advice. Rinse mouth thoroughly with water to remove any food particles or other contaminants, then wait a full ten minutes before collecting the saliva sample. Collecting saliva too soon after rinsing may reduce the amount of DNA that can be extracted, and it can also affect hormone/biomarker analyses. Collect whole saliva by the Passive Drool Method (for whole saliva) into approved cryovials, hold on ice, and freeze at -20°C as soon as possible. Note: Some hormones have specific requirements for sample collection and handling. We urge you to contact us regarding proper techniques and collection supplies before collecting samples. Our Saliva Collection Methods and Techniques Handbook may be downloaded from our website for more information. Collect saliva samples using the SalivaBio Oral Swab Method, hold on ice, and freeze at -20°C as soon as possible. Note: Using the Salivette for DNA analysis has not been validated with Salimetrics DNA protocol. The literature has also reported interference with organic, cotton saliva collection devices when genotyping saliva for DNA analysis. Use the Oragene•DNA® collection device to provide the convenience of integrated ambient temperature stabilization, sample transport, and sample preparation. The device is available in several formats. If using the tube format (OG-500), whole saliva should be delivered directly into the device by placing the kit against the lower lip and spitting into the funnel-shaped end. Detailed collection and mailing instructions can be found in the Oragene•DNA kit package. Use the Oragene sponges (CS-1 Accessory kit) to collect whole saliva that pools in the mouth for small children or people who are uncomfortable with the passive drooling technique. We recommend using at least three sponges to insure adequate volume is collected. Detach the sponges and place them inside the base of the disc format of the Oragene•DNA collection device (OG-250), then screw on the cap to release the stabilizing buffer. Shake vigorously for 30 seconds to mix the saliva contained in the sponges with the buffer. Use additional formats of the Oragene•DNA collection device that are also available, including one for animal use.